Tree after Bitsch & Nel (1999) and Rasnitsyn (1999). This order of wingless insects consists of about 350 known species. They hide under bark, in litter, and in rock crevices, and feed on algae, lichens, and vegetable debris. Oldest fossil considered as Archaeognatha is from the Devonian (390 million years old) from Gaspé, Québec (Labandeira et al., 1988). However, there is little evidence that this fossil is a member of Archaeognatha; it may instead be a member of the stem-group of insects or of stem-Dicondylia. Archaeognathans also share a number of primitive features. Their mandibles are monocondylic, that is, with only one condyle (the joint or socket-like attachement point to the head capsule), whereas other insects have two condyles ("dicondylic"). This primitive mouthpart feature gives the order its name (Arche - beginning, gnathos - jaw). Styli may be remnants of ancestral limbs. Birket-Smith, J. R. 1974. On the abdominal morphology of Thysanura (Archaeognatha and Thysanura s. str.). Entomologica Scandinavica Supplementum 6:5–67. Bitsch, J. and A. Nel. 1999. Morphology and classification of the extinct Archaeognatha and related taxa (Hexapoda). Annales de la Société entomologique de France 35:17-29. Delany, M. J. 1954. Thysanura and Diplura. Handbooks for the Identification of British Insects, Vol. 1, No. 2. Royal Entomological Society, London. pp. 1-7. Denis, J. 1949. Ordre des Thysanoures. Pp. 209-275 in P.-P. Grassé (ed.). Traité de Zoologie, Vol. 9. Masson, Paris. Goldbach, B. 2000. The evolutionary changes in the reproductive biology of the Archaeognatha (Insecta). Zoologischer Anzeiger 239:215-229. Janetschek, H. 1991. Convergences in the equipment of the ovipositor of Machilidae (Insecta, Apterygota, Microcoryphia: Machilidae). Berichte Des Naturwissenschaftlich Medizinischen Vereins In Innsbruck 78:97-102. Labandeira, C. C., B. S. Beall, and F. M. Hueber. 1988. Early insect diversification: Evidence from a Lower Devonian bristletail from Québec. Science 242:913-916. Lawrence, R. F. 1953. The Biology of the Cryptic Fauna of Forests. A. A. Balkema, Cape Town, South Africa. 408 pp. Mendes, L. F. 2002. Taxonomy of Zygentoma and Microcoryphia: historical overview, present status and goals for the new millennium. Pedobiologia 46:225-233. Minter, N. J. and S. J. Braddy. 2006. Walking and jumping with palaeozoic apterygote insects. Palaeontology 49(4):827-835. Rasnitsyn, A. P. 1999. Taxonomy and morphology of Dasyleptus Brongniart, 1885, with description of a new species (Insecta: Machilida: Dasyleptidae). Russian Entomological Journal 8(3):145-154. Schaller, F. 1968. Soil Animals. University of Michigan Press, Ann Arbor, Mich. 144 pp. Silvestri, F. 1911. Contribúto alla conoscènza dei Machilidae dell'America settentrionàle. Boll. Lab. Zool. Portici 5:324-350. Sturm, H. 1994. Discontinuous activity of genes and evolution: a discussion based on examples of the Archaeognatha (Insecta). Journal of Zoological Systematics and Evolutionary Research 32:241-263. Sturm, H. and D. R. C. Bach. 1992. New American Meinertellidae (Archaeognatha, Machiloidea). Pan Pacific Entomologist 68(3):174-191. Sturm, H. and R. C. B. DeRoca. 1988. Archaeognatha (Insecta) from the Krakatau Islands and the Sunda Strait area, Indonesia. Memoirs Of The Museum Of Victoria 49(2):367-384. Sturm, H. and C. B. DeRoca. 1993. On the systematics of the Archaeognatha (Insecta). Entomol. Gen. 18:55-90. Sturm, H. and B. Messner. 1995. Chaetotaxy of tergites in the Archaeognatha (Insecta) and its taxonomic significance. Zoologischer Anzeiger 234:85-100. Sturm, H. and G. O. Poinar. 1997. A new Neomachilellus species from Miocene amber of the Dominican Republic and its phylogenetic relationships (Archaeognatha: Meinertellidae). Entomol. Gen. 22:157-170. Sturm, H. and G. O. Poinar. 1998. Cretaceomachilis libanensis, the oldest known bristle-tail of the family Meinertellidae (Machiloidea, Archaeognatha, Insecta) from the Lebanese amber. Deutsche Entomologische Zeitschrift 45:43-48. Szklarzewicz, T., A. Jablonska, and S. M. Bilinski. 2004. Ovaries of Petrobius brevistylis (Archaeognatha, Machilidae) and Tricholepidion gertschi (Zygentoma, Lepidotrichidae): Morphology, ultrastructure and phylogenetic implications. Pedobiologia 48(5-6):477-485. Tomlin, A. D. 1979. 22. Microcoryphia 23. Thysanura. Pages 304—305 in Canada and Its Insect Fauna. H. V. Danks, ed. Mem. Entomol. Soc. Can. 108. Wallwork, J. A. 1970. Ecology of Soil Animals. McGraw-Hill, London, 283 pp. Watson, J. A. L. and G. B. Smith. 1991. Archaeognatha. Pages 272-274 in Insects of Australia: A Textbook for Students and Research Workers. Volume I. Second Edition. I. D. Naumann, P. B. Carne, J. F. Lawrence, E. S. Nielsen, J. P. Spradberry, R. W. Taylor, M. J. Whitten and M. J. Littlejohn eds. Carlton, Victoria, Melbourne University Press. Wygodzinsky, P. 1941. Beiträge zur Kenntnis der Dipluren und Thysanuren der Schweiz. Denkschr. Schweiz. Naturforsch. Ges. 74:113-227. Wygodzinsky, P. 1955. Thysanura. Pages 83-190 in South African Animal Life 2. Almquist and Wiksells Boktryckari AB, Uppsala, Sweden. Wygodzinsky, P. and K. Schmidt. 1980. Survey of the Microcoryphia (Insecta) of the northeastern United States and adjacent provinces of Canada. American Museum Novitates 2701:1-17. Zimmerman, E. C. 1948. Insects of Hawaii, Vol. 2: Apterygota to Thysanoptera inclusive. Order Thysanura. Honolulu. Pp. 29-38. 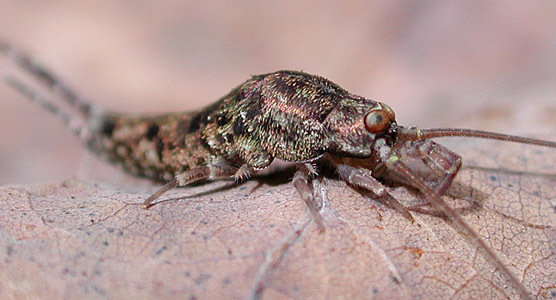 The Bristletails (Archaeognatha) of South Africa. Compiled by John Irish, National Museum, Bloemfontein, South Africa. California Academy of Sciences Archaeognatha Type Collection. Page: Tree of Life Archaeognatha. Bristetails. The TEXT of this page is licensed under the Creative Commons Attribution License - Version 3.0. Note that images and other media featured on this page are each governed by their own license, and they may or may not be available for reuse. Click on an image or a media link to access the media data window, which provides the relevant licensing information. For the general terms and conditions of ToL material reuse and redistribution, please see the Tree of Life Copyright Policies.